As promised on Instagram I share one of my new favorite porridge recipes – Vanilla Porridge with hot berry Sauce. 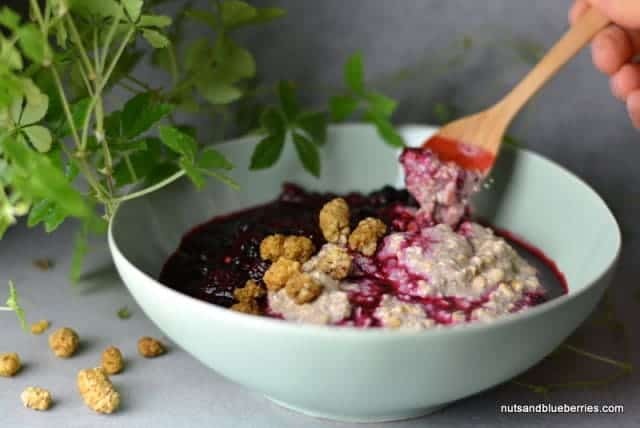 This VANILLA PORRIDGE with HOT BERRY SAUCE topped with MULBERRIES is really easy to make and makes you feel happy the whole day. I love to add some dried berries to my breakfast because I cannot buy them the whole year. Berries are one of the best sources of antioxidants. Dried mulberries are a great source of protein, vitamin C and K, fiber and iron. They are one of my favorite berries, very delicious and sweet. Oats make you feel full longer and they provides a high level of protein. They are also rich in different minerals like a specific type of fiber. 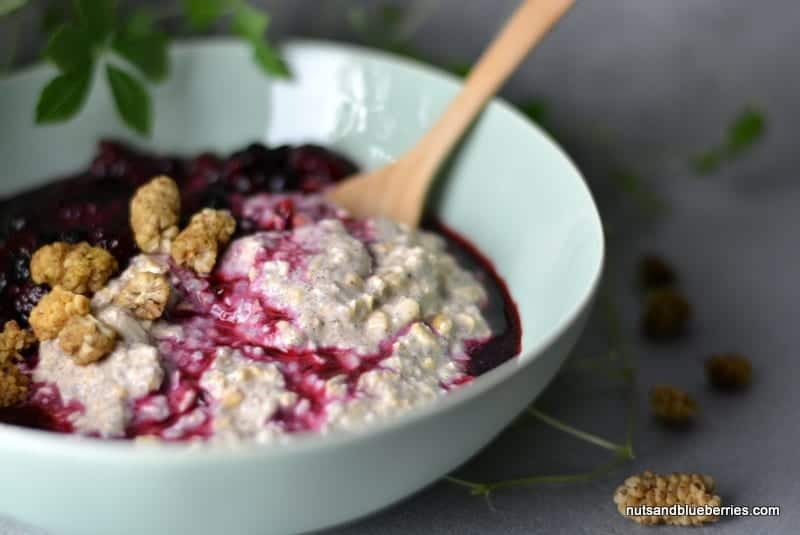 Chia Seeds are rich in omega-3 and they are also rich in fiber and protein. I love to add a lot of flavors to my porridge. My favorite is vanilla. I can’t stop adding vanilla. I’m not the biggest chocolate fan but I love vanilla so so much. With the start of November I also use a lot of cinnamon. Cinnamon can lower cholesterol and it have a regulatory effect on blood sugar. Furthermore cinnamon is a great source of manganese, fiber, iron, and calcium. In the colder month I’m a “warm” eater. I love to add warm sauce on my breakfast. In the evening mix all together and soak in the fridge overnight. Add more milk in the morning if you like. a few minutes. Sweeten with honey or agave syrup.